Selling slush is one of the most profitable drinks you can sell. Our customers are making up to £7,000 additional profit each year (the average being £4,000). Keeping your customers happy is easy when selling Mr Slush. They will keep coming back if you serve a quality branded drink brand rather than cheap, purchased on price, unbranded product. Equally important is having a superior machine that will give you years of trouble free use and the peace of mind knowing we'll have an engineer on your doorstep quickly if you experience any issues. Look at the profits that can be achieved. Regardless of the size drink sold, you should yield an average of £550 per case of Mr Slush syrup. You can spend a little less on cheap unbranded slush and save yourself 1p per drink. However, we're confident you won't enjoy the same levels of returning customers as enjoyed by our retailers. Here's an overview of our costs and sell prices, including profits achievable. * Cost includes the syrup, slush cup and straw spoon. Selling a medium 9oz drink at £1.20. Net profit is £0.86 after VAT. How do we stack up against 'Free on Loan'? Considering free on loan? We don't offer this option. Why? First of all, there is no such thing as free. Free on loan machines are often cheap, 2nd hand machines. They are rarely brand new. They don't look anywhere near as aesthetically pleasing and are not as reliable as new premium equipment. Downtime = lost sales and lost profits. Also, you will probably be tied into a minimum monthly purchase contract with inflated slush syrup prices. It will always cost you more with Free on Loan. How long does it usually take to pay for your slush equipment? We have placed thousands of slush machines over the years. 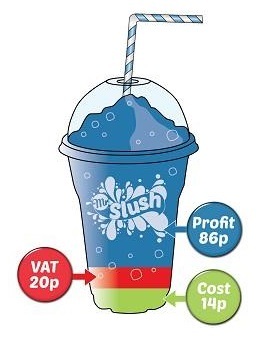 The average time it takes our customers to pay for their slush machine is 4-6 weeks. The record is 8 days. Either option work well for our customers. You'll receive 2,000 drinks either way (twin and triple machines). That's enough to pay for the entire purchase price once sold or pay for at least 2 years lease payments. Leasing is 100% tax deductible and at the end of the term, you own the machine which then also has a residual value of £1,000.